Rhode Island Governor Gina Raimondo said the state is extending its contract with Deloitte, the vendor running the state’s troubled IT system, since the company improved its performance while making significant concessions. The IT system known as UHIP has been plagued by cost overruns and operational problems since it launched in 2016. On Friday, Raimondo said Deloitte has improved its oversight of UHIP while agreeing to give the state a $50 million cash payment and even more in credits. The state’s contract with Deloitte was set in motion by former governor Lincoln Chafee. Deloitte’s cash payment and credits to Rhode Island require federal approval. Raimondo said despite improvements, more work needs to be done to improve UHIP's performance. She said making progress has taken years due to the complexity of UHIP, which is called "RI Bridges" by state officials. While some people called for suing Deloitte, Raimondo said it was more important to get a credit and improvements to the IT system known as UHIP. 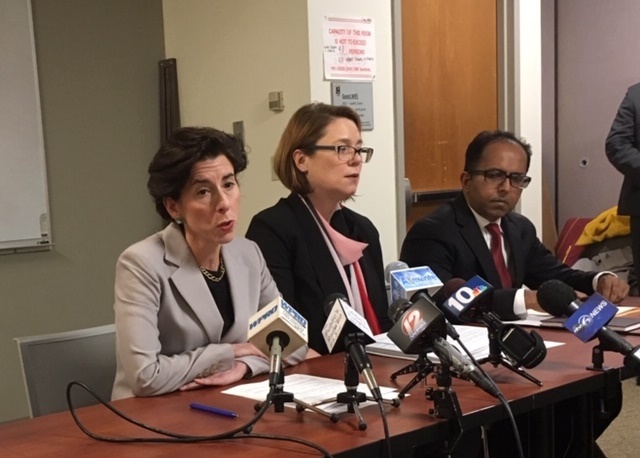 “The approach I’ve taken has been to secure the biggest credit I could for taxpayers and make sure we had a system that’s functioning and will continue to function and be supported so that we could provide services for vulnerable Rhode Islanders,” she said. Asked by reporters if it was a mistake to launch UHIP, Raimondo said, "Certainly, yes, in retrospect." She said the system wasn't ready to go live and that state technology advisers "got it all wrong."